After having passed a strict selection by the Agenzia Spaziale Italiana (Italian Space Agency), in 1992 Maurizio Cheli joined the European Space Agency (ESA) and was sent to the NASA Johnson Space Center in Houston to attend, the first non-US citizen, the course that would have led him to the role of Mission Specialist - professional astronaut. Before then, all the non-US citizens that had flied to space did it as Payload Specialists, to say as specialists of useful load. So their participation to the mission was tied exclusively to their specific scientific skills of one of the on-board experiments. After years of training, in 1996 he attended the Space Shuttle Columbia STS-75 Tethered Satellite mission in which he covered, the first Italian, the role of Mission Specialist. “The night between July 20 and 21, 1969, when I was 10, I attended as other millions people all over the world the greatest exploit in the history of aviation. On the screen of a black and white TV I was able to recognize the shape of a spacesuit that descended the steps of a space vehicle to put a foot on the Moon. Impossible became possible. Going out to stare at the Moon, that night I started to think that that object so far would not have been anymore something mysterious and unknown. "The suit is hot. Even though the internal liquid cooling system the parachute does not surely represents a comfortable cushion, but in this moment there is not another place where he would be. The countdown continues regularly and at T-2 minutes the astronauts close the helmet visors. Suddenly the sounds soften and they hear the breath of their mates becoming more intense. Maurizio briefly repeats the most critique procedures that can occur immediately after the launch, his tasks and those to activate in case of emergency. This time things get serious. 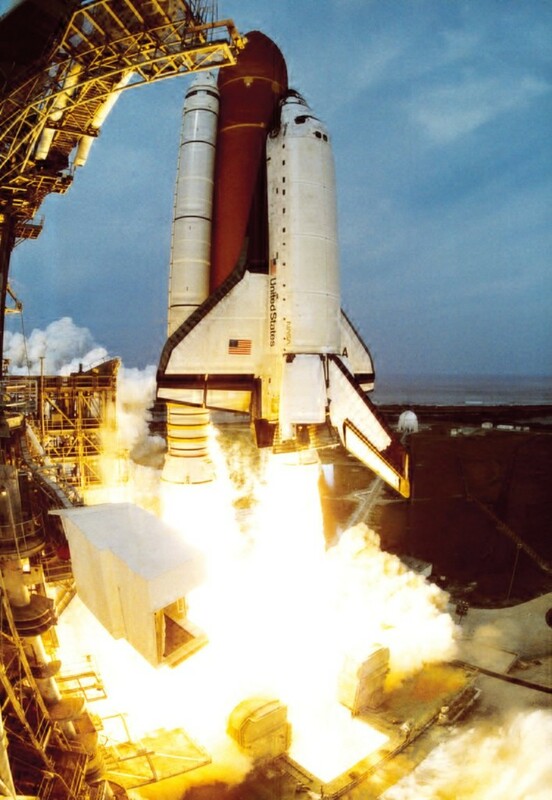 At T-6 seconds, Main Engine Sequence Starts begins the sequence of ignition of the main engines. The countdown reaches T-0. Maurizio feels the vibrations of the structure increasing considerably and almost simultaneously he sees the first launching pad slowly slipping out at the side of the left window. Excellent professionals composed the crew of the Columbia STS-75. Andy, the captain, was at his third flight. He was a test pilot coming form the Marine Corps, with a direct and very easy-going attitude. Scott would have been our pilot. He was a test pilot of USAF, the US military aviation, as well. Franklin was an astrophysicist born in Costa Rica, with a very interesting scientific career. On board he would have been the Payload Commander - the responsible of the scientific load of the mission. This was his fifth mission. Jeff was an astrophysicist as well and he was at his fifth mission. He was naturally attracted by cultural aspects, so that his passion for arts led him to speak Italian discretely. Umberto was in charge of the Payload Specialist role - useful load specialist. He was also an astrophysicist, he had been working since the beginning to the experiments of the satellite that we were transporting in the hold. Claude was an astrophysicist from Switzerland, he was he too an astronaut from ESA and he had already flied once to the space. Maurizio was designed to be the Mission Specialist 2 (MS2),that is the shuttle flight engineer. For this task he would have sit in the cabin crew, between the captain and the pilot and would have supported them in the management of the vehicle in the dynamic phases of the flight, launch and come back. While in orbit he would have been in charge of the management of the Shuttle systems with Scott. He was in charge moreover of two combustion experiments on board, inside the cabin. The Tethered Satellite System (TSS), the wired satellite, represented the main load of the mission. The orbital dynamic of the two linked bodies showed several differences compared to the simulations. The release of the satellite was a textbook one and, even at a distance of some hundred metres, the instruments on board recorded immediately a stream as theory predicted. It was unnecessary to get to the final distance forecasted of 21 km to prove the efficacy of the experiment: the intensity of the stream, in such a system, is directly proportional to distance, and it reaches his peak at maximum distance. AAt 10 km distance a sudden electric arc instantly burnt the wire. The satellite so separated from the Shuttle and after some day it burnt by returning to the atmosphere. An accurate investigation after the flight showed that the electric arc was due to an imprecision of the mechanical manufacturing executed before the launch that had damaged the isolating cladding of the wire. This experiment, as others conducted during space exploration activity, not only showed the necessity to systematically prove theories or technical solutions, but also how space is a special environment for test and experimentation. We go to the limits of knowledge to always discover something new.